Before I got my dog I had noticed so many dogs with badly stained teeth and knew many people who had spent a lot of money at vets getting their dogs teeth cleaned or having dental treatment. On my first visit to my vets they told me I had to get my dog used to me brushing his teeth. This did seem to be very unnatural to me, as during my childhood we had dogs and never brushed their teeth and they all had good teeth, never needing any dental treatment. So I questioned what was different about "modern times" and I personally felt a lot was to do with a dogs diet. It has changed in recent times to kibble / dry food and the majority of dogs I met that did have tartar build up or brown/stained teeth were fed on dry food (kibble, nuts). I decided that I was going to attempt to feed my dog a natural diet. I was lucky as my dog is not a fussy eater and loved his food.. When he was a puppy and still on kibble, I gradually added small quantities of cooked brown rice, cooked mixed vegetables (carrots, brocolli, califlower, peas) together with either raw mince beef, lamb, cooked fish or cooked chicken to his meals increasing the amount slowly, till I weaned him completely off kibble. To help keep tartar away, I mix a small amount of Plaque-Off a teeth cleaning supplement for dogs and cats, once a day. I have found the product to be well worth the money as one pot lasts about 6 months and it works. I also regularly give my dog raw carrots as chewing is very good for cleaning his teeth. Carrots do have a certain amount of natural sugars so too many can make your dog put on weight and some dogs simply do not like carrots, although if introduced when they are young, I think they will all like them. 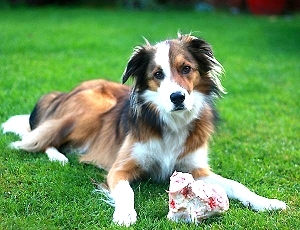 Bones: As soon as I felt my dog was old enough, in his case, six months, I started to give him raw marrow bones. I believe these are perhaps one of the most essential natural foodstuff for helping to keep a dogs teeth clean. He now gets a large marrow bone at least once a week. All puppies and dogs, especially my dog, loved to chew and he chewed anything. I made sure he had plenty of non-edible chew toys and rubbed a bit of something nice and smelly on it to encourage him to chew and gnaw at the item. I have found that my dog tended to gobble down, rather than chew, most the edible chews on the marketplace, such as rawhide chews and denture sticks. Therefore I felt that giving these to him was not beneficial to the cleaning of his teeth. As a word of warning: I would recommend that you do NOT allow your dog to chew or gnaw at dog tennis balls. The nylon bits that a dog will chew / rip off can damage and even get stuck in and under the gums which can cause cuts and inflammation which is then susceptible to bacteria build up and infection. My dog is now completely on a natural diet, his daily meals consist of cooked brown rice and veg, mixed with either beef and offal, lamb, chicken or fish which is supplemented by raw carrots and marrow bones. He does not have any dried food / kibble in his diet and to date he has perfectly clean white teeth with no plaque build up and healthy gums. And I am pleased to say that when he has his annual check up the vets always compliment his teeth and say “what a good job I am doing with his teeth brushing”… they are a little surprised when I tell them his teeth are not brushed ! !